Jacinta Dimase Management - Literary Agent: Where's Jessie? Bertie Bear was going on a long journey. He didn’t realise it would be on a camel! And he never imagined he would be having adventures on his own, far away from Jessie. Bertie sets off with his family to head out into the Outback. He is packed into a box to travel with the cameleers as he won’t fit on the horse-drawn cart with the family (and young Jessie, his owner). But Bertie doesn’t understand where his family has gone. 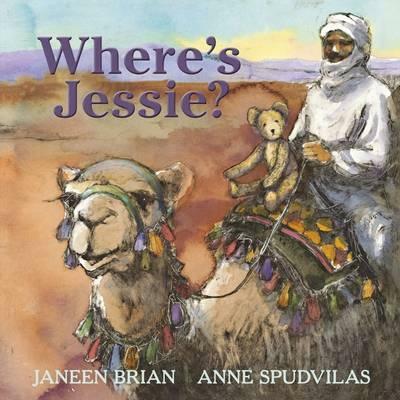 ‘Where’s Jessie?’ is the refrain that runs through the book, as Bertie bumps along on the camel, then falls off unnoticed. Bertie has adventures with the kind cameleers, and meeting desert animals before he is swept along in a flash flood, gets taken high in an eagle’s talons, and finally falls to the ground, left all alone. Luckily, a young Indigenous boy finds him and returns him to Jessie: a happy ending!